Now, Koreans have a reputation for volatility and protests. In fact, there have been articles published to this effect in the US, referring to Korea’s “culture of protest“. This spring it was the Mad Cow protests, which drew quite a bit of international press, but believe me, there are protests here all the time that don’t draw quite so much attention (for instance, the Dokdo debate). Usually, these protests garner a reaction from me (and other expats here) that ranges from eye-rolling to outright anger. But, finally, this time they seem to be striking about something that I actually agree with. Korea’s education system revolves almost entirely around a series of national standardized tests. There is tremendous pressure put on students to do well on these tests, and around the time that they are taken, Korea’s suicide rate spikes heavily(in fact, there was a suicide here in Jindo during the mid-terms this semester that the other foreigners discovered, but I won’t go into that). The tests are stressful for elementary students, and by the time they reach high school, it reaches almost absurd proportions. It is such a big deal culturally, in fact, that on the day of the high school exam, police ferry students who are running late to their testing site, and fellow students who are not testing that day wait outside the schools to cheer on their friends. There have been student protests before, but this is the first time, to my knowledge, that the teachers themselves have had a protest/strike (well, the second, I suppose, if you count the original incident which led to this current demonstration). Now, I am actually a fan of civil disobedience (I was somewhat of a troublemaker in high school and especially college, and hell, I date a Frenchman), when done properly (nobody is hurt and property is not damaged) and for a good cause , and this, to me, qualifies. Personally, my favourite is the teacher who decided to hold his class outside. Props to the guy and students who decided to brave the cold of Korean winter to make a point. Kind of like instead of a teach-in, it was a teach-out! If you were the Minister of Education and your country consistently ranked among the worst at English standardized tests in the world, in spite of students spending thousands of dollars each for years or decades studying exclusively for them, what would you do? You’d scrap the test, of course. Man, talk about shooting yourself in both feet. Way to go, Korea, way to go. Good luck getting your kids into schools abroad. Oh, wait, maybe that’s not such a great idea anyway, considering that almost half of them quit/flunk out of schools abroad anyway. Maybe you should just stick with buying residency in foreign countries or having your children adopted by American families, both so that you can qualify to send them to an international school in Korea. For a country that puts so much emphasis on preparing for tests, it amazes me that they do so abysmally. Oh man, it just keeps getting better. Here in Korea, about 3-4 months before a teacher’s contract is finished, the school will go to the teacher and ask them if they think they want to renew. That’s a reasonable amount of time, as they have now spent 8-9 months here, and probably have a good idea of whether or not they want to stay. However, yesterday my co-teacher informed me that they want an answer now, after only 6.5 months here. Barring a breakup with Marc, I will be going home, but I don’t really want to close the door here just yet, not until I get back from winter vacation. I was told in the morning to make a decision by the end of the day, but since I had to judge an English competition in the afternoon, and then hold a meeting about the teachers’ workshop that I teach, I didn’t remember to email her back about it. I did, however, receive an email from the provincial office saying that some schools may be asking early this year, but that we did not need to give them a decision until December 29th. So, I figured that was that, and that I would give myself a couple days. Well, I got a call at 7:30am this morning (thankfully I was already awake due to my internal clock being set on “Dali” these days), asking for my decision. I explained that the provincial office said that I had until the 29th. My co-teacher insisted that no, she needs an answer today, and that Tuesday or Wednesday will not do. I told her to mark me down as “No”, but that that could change sometime in the future, potentially. Really, though, it’s highly unlikely. My school seems to exist in an alternate universe to the one that the provincial office exists in, and that really bothers me. Even if I were to stay in Korea, I do think I would switch schools. I like Jindo, but I think that this area has some major kinks to work out, and as an experienced teacher, I can be put to better use elsewhere, at a school that knows how to actually use their foreigners. I’ve been feeling better about things here lately, but today’s early morning phone call, combined with the gray weather I’m staring at right now, has put me in a bit of a sour mood. Most of the time here in Korea, I am not exactly happy, but not really actively hateful; grouchy is a good term. I even have some happy days. But, I do have what I call “hate Korea” days an awful lot. Today was one of those, and I’m so glad my school let me go early, because I was seriously stressing out while fuming at my desk, and my shoulders were quickly turning into bricks. You see, Koreans often have trouble with the process of planning ahead. They don’t do it. They also are not the world’s most logical thinkers, especially when it comes to critical thinking. It’s not their fault, it’s just a product of their education system, and, to a degree, the culture. 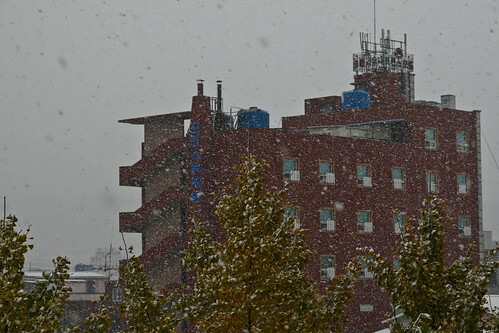 Public schools in Korea typically offer winter camps and summer camps for students who want to work on a particular subject. English is popular (though the kids usually are there only because their parents make them), and so most of us ESL teachers get roped into teaching said camps during the holidays. That, in itself, is not a problem. What bugs me is when my school waits until TWO WEEKS before the winter holidays start to begin preliminary planning for said camps. They don’t even know when exactly they are going to happen, or how many kids there will be, etc. Not only that, but everyone is in the middle of exams right now, so teachers are busy with all that, instead of being able to plan for these camps, because nothing was done beforehand. What this means for me is that this afternoon, my co-teacher/minder came to my desk and told me that I have to make 20 hours of lesson plans by Monday morning. Not only that, but the lesson plans all should ideally be along a theme, and they should all be of such a sort that will work well consecutively, since I am seeing the same students every day for four hours. Yes, you read that right, they expect that middle school students will be able to pay attention in a foreign language class for four hours. Even in the immigrant classes I taught in the US, our longest classes were 3 hours, and even with those, which were comprised of adults who really, honestly, enthusiastically wanted to learn the language, by about the 2.5 hour mark, keeping their attention and energy level up was a constant battle. I have tried to explain this to my co-teacher, and have requested that rather than one class of, say, 30, they will get far, far better results with two classes of 15, even if each class has me for half the time they would have otherwise gotten. Koreans tend to have difficulty with the concepts of quality vs. quantity and of diminishing returns, and this is truly a prime example. Argue as I might, she wouldn’t give in, and insisted that forcing 30 kids to try and pay attention for 4 hours is far, far better than giving 15 kids more personal attention for 2 hours. I miss my friends back home, and my boyfriend Marc, but the times that I really think about coming home are the days like today. I miss folks dearly, but if I were ever to “pull a runner” (leave in the middle of the night), it would not be (primarily) because I want to go back home, it will be because this country has finally driven me to my breaking point. Inspired by CowsByTheFence‘s recent post, I figured I should mention about teaching here during exam season. Exams are the paramount part of the Korean education system. Those exams determine how good of a middle/high school the students are able to get into, and they study for a ridiculous amount of time, both in school and at cram schools. Toward the end, many of my students are out at cram schools until 2am – remember, these are middle schoolers. What this means for me at school is that I end up with a severely reduced class schedule. Usually I teach 3 classes or so a day at my schools. When the students are studying, I don’t teach that class, and so I have been having days where I only teach once, or sometimes not at all. That doesn’t mean that I get to go home though – two of my three schools require me to sit idly at my desk until 5. Now, it’s okay, as I use that time to work on my blogs, my reenacting units’ websites, and to chat with folks back home. But, to counter what I suspect will be cries of “but you don’t have to work!”, I will say that really, I would rather be working. Sitting at your desk for 8 hours, with nothing particular to do, does get boring when it’s day after day, and I feel somewhat useless. Now, technically that time is “preparation time”, but in reality, I only teach one lesson plan per week, and weird as it sounds, I tend to actually literally “dream up” my lesson plans as I sleep – I keep a notebook on my bedside table, in fact. My co-teachers find this hilarious, but really, my lesson plans have been pretty popular with the students, so they don’t seem to care where they come from. Since it looks like I will be teaching 2-3 weeks of camps during the winter holidays, I will soon start to use that time to plan activities for those, but until I have something concrete as to the length and preferred content of the camps, I don’t really want to put any effort into it, as it would likely just have to be discarded. I am really surprised that my school district has decided to run a middle school camp this winter. The camp they ran this summer was so unpopular that they had to pay the students to attend, rather than the other way around, and I’d imagine that they’d have an even stronger negative reaction for a winter camp. Ah well, that’s Korean logic for you. At least the new foreigner arrives today. Everyone in town is greatly anticipating her arrival. Oh my god. That was the coldest I’ve ever been in my life, I think. My WWII German parka got its trial-by-fire, and by the time I got to school, the formerly gray parka was completely white in front. Snow was plastered to my entire front, and I had to wipe off the front of my facemask every 5 seconds. I wish I had a photo, I must have looked hilarious. In my defense, it wasn’t snowing until about 5 minutes into my 20 minute drive, so I had no idea. I would not normally drive a bike in conditions like that. Even wearing two pair of dense wool socks as gloves while I was driving, my fingertips still hurt, after 10 minutes in a heated room. The other day one of my students hocked a lougie into my motorcycle helmet at some point during the day. Sometimes they test me, they really test me.